160 pages, 5.5" x 8.5"
One of the most overlooked topics in the field of survival medicine is nursing. Doctors or medically trained survivors can patch up a patient after an injury or accident, but it is the survival nurse who provides extended long-term care as well as the dozens of related activities that support the healing process under less-than-ideal conditions. 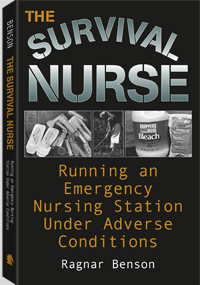 This timely companion to Ragnar Benson's best-selling books on survival medicine tackles the many issues that every serious survival nursing program must face. You will learn the ins and outs of the "big five" considerations of survival nursing; the must-have supplies to keep in stock and how to obtain them; tricks for handling the mountains of laundry generated by a nursing station; how to maintain a low profile with your survival nursing station and why it's important; how to sew up wounds, pull teeth, deliver babies and provide physical therapy under primitive conditions; and more.